All classes are on Wednesday or Thursday evenings. All classes (except where shown on individual class pages) run for 12 weeks in the Autumn term and 11 weeks in the Spring term. 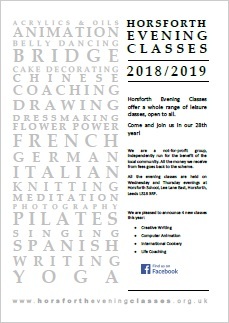 In addition to the half-term break, there will be no classes on 3, 4 October 2018, due to events at Horsforth School.